Yo estoy enamorado de vino de Rioja, Viña Ardanza. This baby will set you back a cool $35, but baby, it’s so worth it. I know, I know, my last wine choice was under $10 and this one is more than $30, what gives? All I can say is that my wine drinking habits are about as bipolar as I am. I never said I made sense. Eyes rolled back in my head. Hot. Damn. I asked for a full pour. She advised it was $18 a glass. You know what, I didn’t even balk. Not because I was on vacation, but because it was worth every penny. A bit surprised, she blessed me with a very generous pour. I savored that pour for a good long while. Flash forward three months and I found myself at Thomas Liquors on a Saturday at 9:30 pm, sneaking in during the last ½ hour of their wine sale. I’m perusing, grabbing comfort bottles here and there. Then, I looked up, and… There it was. 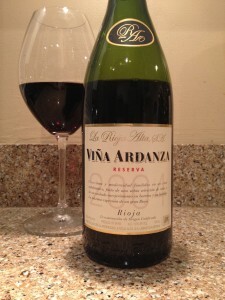 Viña Ardanza Reserva Rioja 2004, sitting proudly on the top shelf. An overhead bulb mimicked that of a spotlight, it’s gaze directly showcasing this glorious bottle. As if in a trance, I slowly extended my arm and gently reached for the bottle. Oh, I was so giddy! I’ve written about other Riojas but not one of this caliber. A quick reminder Rioja is not a grape varietal rather it is wine made with grapes from the La Rioja region of Spain. Grape varietals include: Tempranillo, Garnacha, Graciano, Mazuelo and Macabeo. La Rioja Alta is a winery celebrating 125 years. Back in 1942, they registered Viña Ardanza (now their most famous wine) which is dominantly a blend of Tempranillo and Garnacha. Previous PostCK Mondavi MerlotNext PostThe Savvy Lush’s favorite wine shops in the Twin Cities.